After the Windrush scandal: are other groups a target? The current “Windrush” scandal — where the Home Office has accused a number of long-settled individuals of being “illegal immigrants” — has thrown into relief the many consequences of the government’s “hostile environment” (pdf) policies. Taking a longer historical view, however, illuminates another stark warning: the possible repercussions when governments undertake major shifts in immigration enforcement without sufficiently considering expectations that were in place when previous immigrant groups arrived. This is an essential warning to heed as the government attempts to deal with the post-Brexit status of millions of EU immigrants. To see just how profoundly expectations about internal control have changed in the UK, it is worth looking further back than the beginnings of today’s “hostile environment.” Our recent article in the Journal of Ethnic and Migration Studies uses archival evidence to examine how the Home Office approached immigrant documentation in the late 1960s — when many of the immigrants decades later suspected as “illegal” first arrived. As we chart in our article, the Commonwealth Immigrants Act 1962 had attempted to govern aggregate flows of immigration. It provided very few tools to punish individual transgressions of the rules. However, the Home Office soon began to move in that direction, mostly for symbolic reasons — aligning policy to fit popular perceptions of effective immigration control. Few in the Home Office thought a more punitive and individualised approach would aid their goal of reducing immigration. Accordingly, expectations about individual documentation were completely different, on the part of both immigrants and immigration officials. This had major implications when the Home Office demanded proof that immigrants from this era had settled in Britain before 1973. For instance, in our article we examine the 1969 requirement that Commonwealth dependants arriving for settlement acquire “entry certificates” before embarking. Today it may be difficult to believe, but before 1969, almost no documentation was strictly required for these children to enter and settle in the UK. A passport would be produced, but many children were on their parents’, so any stamp confirming settlement rights in the UK might have been included in a passport that belonged to someone else, likely now to be long discarded. The Home Office’s goal in the late 1960s was to reduce immigration numbers, but they did not believe that simply requiring more paperwork would do this. In fact, this change was delayed for years in part because officials believed that it would be untenable to exclude people who appeared at the ports with obviously legitimate claims, but who did not have the right paperwork. Nevertheless, the Home Office came under political pressure to enact the change. But the Home Office issued no further paperwork to these immigrants systematically upon arrival, either before or after 1969. Demanding such paperwork a half-century later was bound to produce Kafkaesque situations. One reason it was possible for immigrants to have such little paperwork is that the UK did not operate any system of internal checks at this time. In the 1960s, the UK’s system for Commonwealth immigration was conceptualised as based entirely at the port. While Commonwealth children were often subjected to invasive scrutiny at the ports of entry, Commonwealth citizens (unlike aliens) were not required to register with the police, and they were rarely admitted with conditions. Policymakers believed internal monitoring would be difficult to set up, resource-intensive, and unlikely to produce results. Of course, today’s “hostile environment” includes a wide variety of checks, based on the apparent presumption that all legal immigrants are well documented. But we must remember that this is a recent development. In the 1960s, Home Office policymakers questioned the value of internal checks that would need to be premised on expectations of individual documentation which they knew not all individuals legally settled in the UK would meet. In subsequent years, many of the individuals recently challenged to prove their status failed to obtain paperwork to confirm a status to which they had been considered entitled under law. The difficulties they have faced under shifting policies highlight possible issues for other groups. While the current scandal has focused on “Windrush” immigrants from the Caribbean, the same issues seem primed to ensnare other Commonwealth immigrants who arrived under the same system and with the same documentary expectations. In contrast to Caribbean immigrants who arrived in the UK from islands that were not yet independent, immigrants from the Subcontinent are likely to have been more aware of their status as immigrants. But child immigrants from the Subcontinent often arrived with even less documentation than those from the Caribbean, as prior to 1969 the issuance of entry certificates there was much less common. It is likely that recent enforcement efforts are affecting long-settled Commonwealth immigrants from well beyond the Caribbean. Looking forward, the current controversy also raises significant concerns about the status of EU immigrants in the UK. Their situation is broadly analogous: like pre-1962 Commonwealth immigrants, they arrived under a free movement regime, and with relatively light expectations around individual documentation and registration. Despite repeated promises that current EU immigrants’ status will be sorted out sympathetically, the aggressive demands the Home Office has recently made of long-settled people raise major concerns about whether it has the institutional culture to follow through on such promises in the long term. Sadly, therefore, the current scandal is also a warning. It highlights what happens when the Home Office enacts new policies with no apparent regard to its own institutional history. A cascade of media coverage has highlighted cases of “Windrush children” immigrants who settled legally in Britain as children before 1973, but in recent years have been challenged by the Home Office to prove their immigration status in the UK. Amelia Gentleman at the Guardian initially brought attention to several perverse cases, and with the government drawing intense criticism in parliament from David Lammy and others, the home secretary has now been forced to apologise. A common observation is that these people have been caught out by the “Hostile Environment” strategy the Home Office has increasingly adopted since Theresa May became home secretary in 2010. But to see just how profoundly expectations about internal control have changed, it is worth looking further back. In our project’s first article, published online last week, we focus on UK policy toward irregular immigration in the 1960s – the time at which many of these individuals, decades later suspected as “illegal immigrants,” first arrived. The big-picture observation Christina and I make in our article is that the Home Office at this time adopted policies toward irregular migration that were “symbolic,” responding to political pressure to accord with public accounts of what kind of immigration control would be sensible. Few in the Home Office thought that more punitive and individualised approaches would actually aid their policy goals. One of the main episodes we examine was the requirement that Commonwealth dependants arriving for settlement acquire “entry certificates” before embarking, a policy which was introduced in 1969. Before 1969, almost no documentation was strictly necessary for these children to immigrate to the UK. A passport would be produced, but many children were on their parents’, so any stamp conferring settlement rights in the UK might have been included in a passport that belonged to someone else, likely now to be long discarded. Even when this measure was adopted, it was symbolic. The Home Office’s goal in the late 1960s was to reduce immigration numbers, but they did not believe that simply requiring more paperwork would do this. Nevertheless, they came under political pressure to enact the change. So the requirement that these children have entry documents was half-hearted, and the Home Office issued no further paperwork to them systematically upon arrival, either before or after 1969. Demanding such paperwork a half-century later was bound to produce Kafkaesque situations like the ones we’ve seen. One reason it was possible for immigrants to have such little paperwork is that the UK did not operate any system of internal checks at this time. 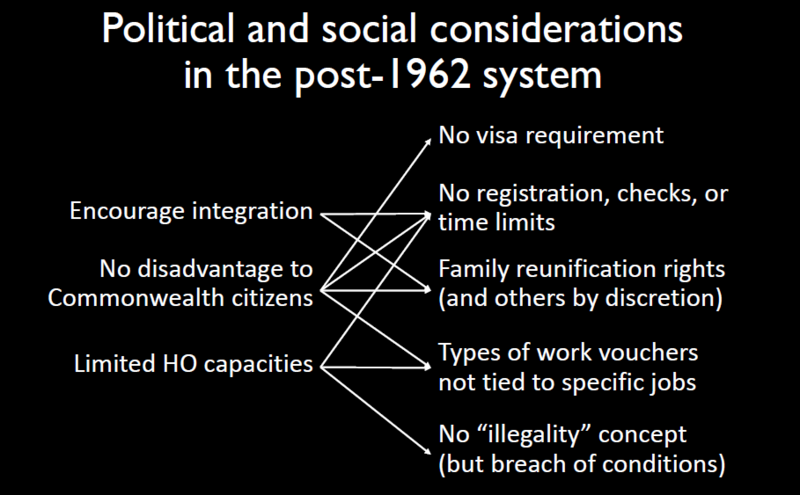 In the 1960s, the UK’s system for Commonwealth immigration was conceptualised as based entirely at the port. Unlike aliens, Commonwealth citizens were not required to register with the police and were rarely admitted with conditions. Policymakers believed internal monitoring would be difficult to set up, resource-intensive, and unlikely to produce results. In our article, we quote the permanent secretary of the Home Office in 1965 as responding to proposals to begin relatively modest forms of internal monitoring by saying: “they are likely to be least effective with the kind of people we would most wish to keep out.” Given that they would likely be ineffective, measures to introduce more robust systems of ID and eligibility checks were not introduced at this time. Of course, today’s “Hostile Environment” includes a wide variety of such checks, based on the apparent presumption that all legal immigrants are well documented. But we need to remember this is a recent development. The Home Office has not always been focused on internal monitoring. On the contrary, in the 1960s, most officials believed it would be ineffective, and would possibly ensnare those who were not the intended targets. Between 1962 and 1968, Commonwealth immigrants could not immigrate “illegally” to the UK – they could be turned away at the port and sent home if they were deemed not to qualify, but this ability to inspect them lasted only 24 hours. If they had entered clandestinely (or were let in despite not genuinely being eligible), after a day, they were de facto able to stay. This underscores how characterising any Commonwealth immigrants who arrived before 1968 as possibly being “illegal” is itself a nonsense. Consider this: today, the Home Office is demanding that “Windrush children” prove they settled in the UK before 1973. But many of these people cannot show they arrived before this time, because beyond a stamp possibly in someone else’s passport, the Home Office did not in fact issue any such proof at the time. In subsequent years, many of these indviduals failed to obtain paperwork to confirm a status to which they had been considered entitled under law. The “Hostile Environment” represents a significant advance in the UK’s internal monitoring regime even compared to 30 years ago (the topic of our current fieldwork), and in many regards represents the precise opposite of the policy reasoning of the Home Office when these “Windrush children” arrived. In the 1960s, while children were often subjected to invasive scrutiny at the ports of entry, the system was not focused on the individual transgression of immigration rules, and the rights of Commonwealth dependants were intended to prevail if they appeared to the officer at the port to have a legitimate claim to settle, paperwork notwithstanding. Accordingly, expectations about individual documentation were completely different, both on the part of immigrants and immigration officials. The Home Office in the 1960s knew the issues with conducting internal checks given that Commonwealth migrants could be legally settled in the UK with little documentation at all. Indeed, officials in the late 1960s were actually worried about excluding Commonwealth citizens who had a legal right to settle in the UK on the grounds that they did not have the right paperwork. Today, these concerns seem particularly painful in the context of the terrible cases highlighted by journalists and MPs. Unfortunately, this recent controversy highlights what happens when the Home Office enacts new policies with no apparent regard to its own institutional history. Last Wednesday, the UK Government published its long-awaited Position Paper on Northern Ireland and Ireland, setting out how it hoped to maintain a border-free zone with Ireland once it has left the EU. Section 2 of the paper deals with maintenance of the Common Travel Area – suggesting how the UK and Ireland might sustain free movement and rights of Irish and UK nationals post-Brexit. Many commentators have questioned how these provisions can be preserved, once the UK starts to impose restrictions on the free movement of EEA nationals. But the paper helpfully clarifies a few misconceptions that have caused much confusion over the past month. The key point is that any immigration restrictions on EEA nationals are likely to be enforced post-entry. In other words, immigration control won’t take place at the border, but once people are in the UK. Indeed, it is likely that EEA nationals will continue to be able to enter the UK (as visitors) after Brexit. What will change is not their ability to travel to the UK, but their right to reside and work in the country. Once the UK leaves the Single Market, it is assumed that EEA nationals will no longer enjoy an automatic entitlement to live and work in the UK. And these new restrictions will be enforced through checks and controls on access to employment, benefits and services. The UK is rightly confident in its ability to enforce immigration rules through such internal checks. Over the past few decades the government has been rolling out its capacity to control non-nationals resident in the UK. Key to this approach is to enlist organizations in other sectors – whether employers, social services, higher education, health, private housing, or banks – to enforce restrictions on the access of irregular immigrants to key social and economic services. Most notably, employers and higher education organizations have been given the role of ‘sponsors’ who are delegated the responsibility of monitoring employees and students from outside the EU. These policies are intended to create a ‘hostile environment’ for irregular migrants, making it impossible for them to carve out a viable life in the UK. This approach recognises that border control cannot effectively stop irregular migration, a large portion of which involves overstay of visas. Of course, it is always possible that EEA nationals may successfully evade these controls. But they will have limited incentives to do so – given the risks and difficulties associated with trying to access employment, housing, banking or healthcare without authorisation. Indeed, the types of mobility most associated with irregular stay and work involve those employed in lower-skilled, lower-paid and less regulated sectors – such as informal work in domestic services or some areas of agriculture, construction, hospitality and catering, where employers may have less incentive to check documentation and employ workers on the books. Recall, too, that those most likely to be drawn into such irregular work and stay are those with limited life prospects in their country of origin – those without attractive or viable alternatives. So irregular status in the UK is unlikely to be an appealing long-term prospect for nationals from relatively stable and prosperous EEA countries. 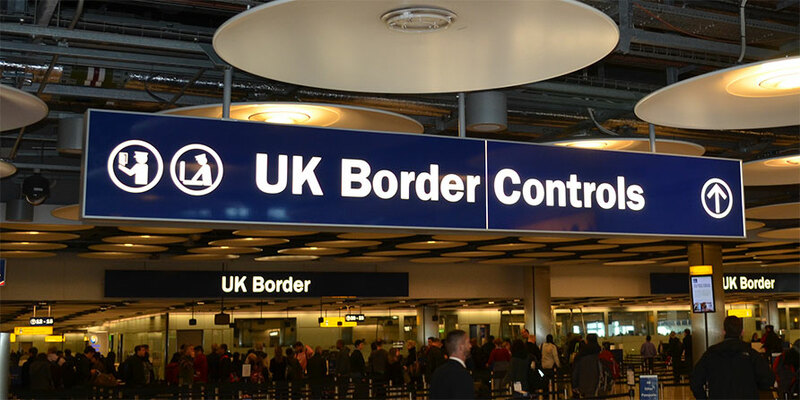 What may be more of a headache for the UK government is potential cross-border flows of non-EEA nationals, especially those with the features described above – escaping difficult conditions at home, and employed in lower-skilled and less regulated sectors. Here, there may be some potential for cross-border movements resulting in irregular stay and work. But here, as the paper points out, UK and Irish policy is broadly aligned. Neither country is part of the Schengen Zone – and they have developed close cooperation on visa and entry policies for third country nationals. The principal risk here is if Ireland were to join Schengen – a prospect that seems highly unlikely, given both Ireland and the EU’s support for sustaining the CTA. So the paper doesn’t offer much that is new or surprising on immigration control. But the paper’s explicit clarification of these points about border and internal immigration control does offer food for thought. First, it weakens one of the arguments marshalled against Scotland (or other parts of the UK) adopting a differentiated approach to immigration. One of the main arguments against such a devolved approach is that it risks onward movement from Scotland to the rest of the UK – Scotland would become a ‘back door’ for immigrants. But this position paper acknowledges that this is not a problem in relation to Ireland, even in the event of the UK leaving the Single Market – that much immigration control effectively takes place post-entry, and that it is possible to align visa policy for third-country nationals. So that knocks out one of the main arguments for refusing Scotland more autonomy over its immigration policy (see the recent paper I co-authored on this with Sarah Kyambi and Saskia Smellie). Second, it implies that future UK immigration policy may rely more on such internal controls. The subtle message of the paper seems to be: trust us, we have further plans in this area. The area of internal immigration controls has evolved rapidly over the past years. But successive governments have also been frustrated at resistance from some sectors, who are reluctant to play a role in enforcement (teachers and doctors have been notably reticent about complying). Remember, too, the demise of Labour’s universal ID card plan – a scheme which may well be revived to deal with new migration control challenges. It wouldn’t be surprising if such proposals find their way back onto the agenda. In short, we are likely to see a further push for these forms of post-entry control. As a final thought, if the UK is developing internal enforcement in this way, it begs the question as to whether such controls could address concerns about EEA immigration – those very concerns that prompted many to support Brexit. One of the reasons the UK has implemented free movement provisions in a less robust way than some of its continental neighbours is its lack of state capacity to monitor the whereabouts of non-nationals. The UK lacks the type of registration system and ID cards that most EU countries have had for decades. The UK is also hampered in this by its welfare system. EU countries with contributory welfare systems are better equipped to exclude new (EU) immigrants from welfare benefits. In the event of the UK deciding it needs to accept free movement provisions to retain access to the Single Market, the UK government is likely to need to rethink these provisions. So whether in or out of the Single Market, we should watch this space. The exigencies of immigration control are likely to have a profound effect on how the state monitors, and allocates resources to, its population. 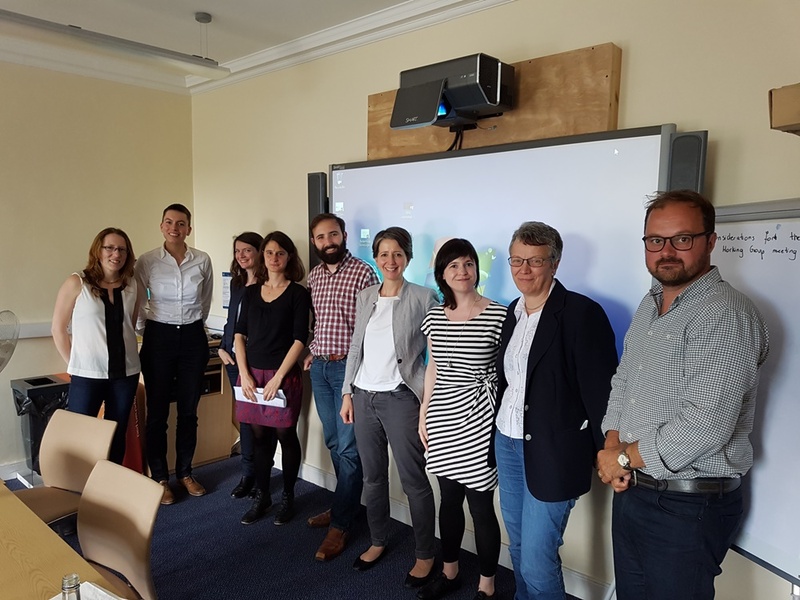 The Council for European Studies (CES) held its 24th international conference at the University of Glasgow on 12-14 July 2017. 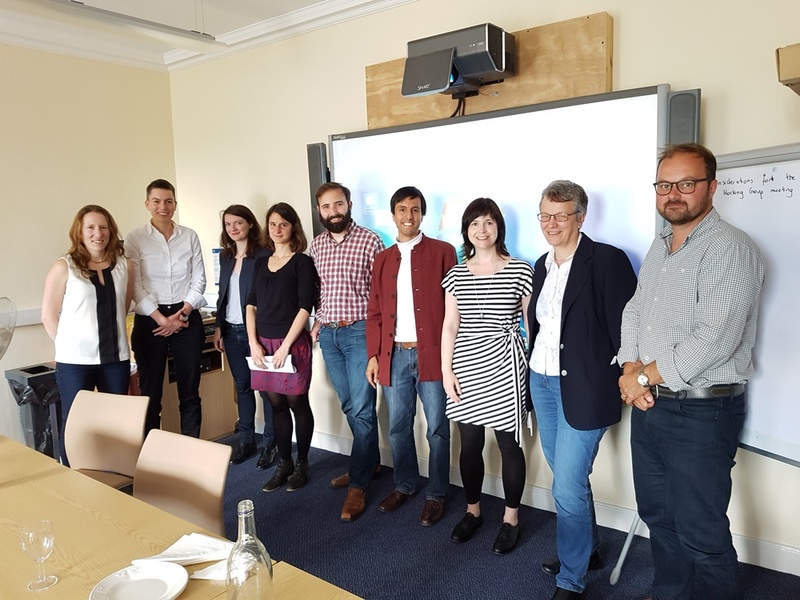 Half-way through the SIMs project, this presented a great chance to bring together expert scholars and to present findings from the archival fieldwork to a wider audience following the highly successful SIMs workshop earlier that week. I organised a panel entitled ‘Seeing ‘Illegal’ Immigrants: State Monitoring Practices in Europe and Beyond’. It was chaired by our PI, Christina Boswell, and it fell within the CES immigration research network. The panel combined five papers presenting a mix of theoretical and empirical analyses of irregular migration, with a focus on state institutions and migrants’ agency, offering different country case studies of historical and contemporary nature. The first paper “Decent Illegals – How Some Irregular Migrants Are Perceived Smoothly” by Giuseppe Sciortino and Martina Cvajner (both from Università di Trento, Italy) considered the complex stratification of illegality that is not captured by legal and political binaries. Drawing on a decade of research on irregular migrants in Italy, Sciortino and Cvajner argued that states are more likely to “see” young men in the public sphere than older female caregivers in domestic households, even if they happen to hold the same (il)legal status. Dita Vogel (Universität Bremen, Germany) followed with a paper combining macro with micro-level approaches in which she argued that we need both perspectives to fully understand irregular migration. By supplementing Sciortino and Cvajner’s work on systems theory and Anna Triandafyllidou’s research on migrant agency with social-psychological models of individual agency, Vogel not only provided a bridge between all panel contributions. She also demonstrated her argument with a recent telephone survey of primary schools in Germany which found that even though education providers are no longer under structural constraints to report undocumented students, 62 out of 100 school teachers still thought it impossible to accept irregular children. The third paper by Jennifer Elrick (McGill University, Canada) presented the outline of her new research project on “Specifying the Role of Immigration Bureaucracies in Immigration Control: A Historical Case Study of Canada, 1952-1976”. While Canada is typically seen as a migration friendly “settler country”, it operated an explicitly racial exclusionary immigration policy in the 1950s. By analysing archival files from the Citizenship and Immigration Department, Elrick aims to shed light on the role of high-level bureaucrats in paving the way for a more liberal immigration policy in Canada. She gave three examples of how Chinese fiancées, adopted children and non-European skilled workers came to be seen as “admissible” by senior officials several years before the statute books were changed by 1967. I presented a paper on the origin and establishment of the German Central Foreigner Register (Ausländerzentralregister, AZR) that was set up in 1953 and has become a key migration monitoring technique today. Based on records from the Federal Interior Ministry stored at the Bundesarchiv Koblenz, I argued that the German Central Foreigner Register was created to enhance and standardise migration control in a federal state system following external pressures by the Allied Forces who expressed concern about inconsistent registration practices. However, due to a lack of cooperation and resources, the Register led to unintended consequences such as skewed migration statistics and cases of inadvertent legalisation. Finally, Eda Gemi (European University of Tirana, Albania) presented a paper co-authored with Anna Triandafyllidou (European University Institute, Florence, Italy) focussing on migrants’ agency. Based on a recently completed research project on contemporary irregular migration to Southern Europe, the paper analysed the experiences, motivations and decisions by irregular migrants coming to Greece from Albania, Georgia, Ukraine, Pakistan and Afghanistan. Gemi and Triandafyllidou found that, while all interviewed irregular migrants stressed the role of kinship networks and smuggling agencies, the main obstacle to these migrants was unauthorized border crossing in the case of Pakistan and Afghanistan, compared to obtaining official or forged visa documents in the cases of Georgians, Ukrainians and (to a lesser extent) Albanians. Each paper benefitted from the valuable questions and comments from the panel discussant, Andrew Geddes (University of Sheffield, UK) and from an engaging audience. The panel members and SIM researchers continued the lively discussion in the evening over haggis and other culinary delights. Thank you to everyone for contributing to what was a fascinating and enjoyable panel! All projects need milestones. With this in mind, we decided to mark the (almost) one-year anniversary of the SIMs project with a one-day interdisciplinary workshop on 11 July 2017. In contrast with all of the previous workshops, which have involved discussions amongst members of the SIMs team, this event included a range of other experts, including members of our advisory board. 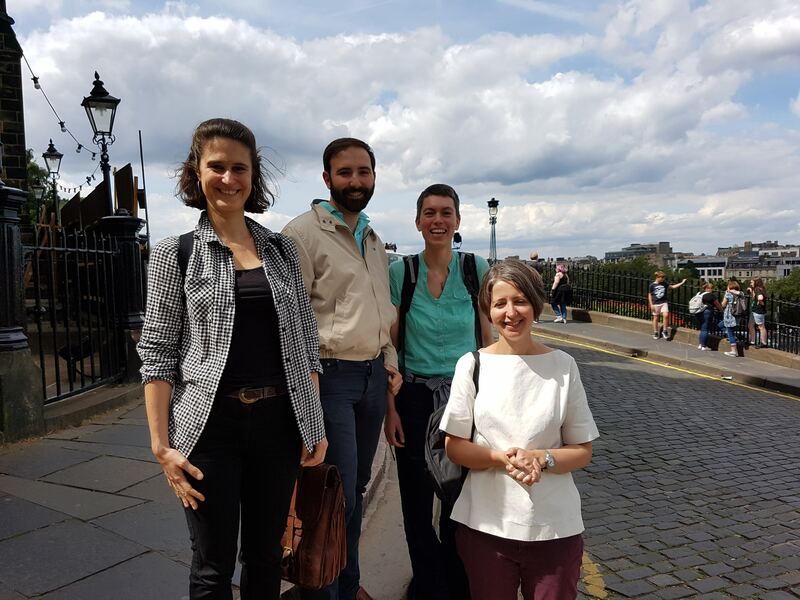 In addition to the three SIMs postdocs and the two investigators, we welcomed Sarah Kyambi (Edinburgh), Cetta Mainwaring (Glasgow), Angéline Escafré-Dublet (Université Lyon II), Jennifer Elrick (McGill), Dita Vogel (Uni. Bremen) and James Hampshire (Sussex). From right to left: Cetta Mainwaring, Elisabeth Badenhoop, Angéline Escafré-Dublet, Sara Casella-Colombeau, Mike Slaven, Christina Boswell, Jennifer Elrick, Dita Vogel and James Hampshire. We organised the workshop in such a way that each of the postdocs was able to present some initial findings in the form of a pre-circulated paper and then receive comments from one or more external member. It proved to be an excellent model that was stimulating and engaging for all concerned. As one might expect, many of the comments were related to the specific cases. For example, James and Angéline highlighted the importance of the imperial past in France and Britain. They reminded us that ideas of illegality in the 1960s and 70s were disproportionately determined by questions of race, ethnicity and origin. Because these played such an important role in state monitoring logics, they suggested that we consider the impact of these structures more deeply. In the case of Germany, Dita emphasised the organisational structure of the German federal state in the 1960s, while Jennifer encouraged us to think more carefully about the degree of competition between national and regional (Länder) government. There was also some discussion about the extent to which the German case needs to understood in relation to the Nazi, Weimar and Bismarckian legacy. With such a rich range of approaches on show, several of our guests raised the possibility of cross-case comparisons – particularly in relation to the administrative mechanisms that were used to monitor illegality in the 1960s and 70s. This will probably need to be developed on a case-by-case basis since, as the postdocs have discovered, archival documents are complex sources that lend themselves more readily to close-grained thick description than broad-brush comparisons. Sadly, there was not enough time for the two investigators to present their joint theoretical paper about the emergence of illegal immigration as a social problem in France and the UK. There was, however, a chance to talk about the core hypothesis, namely that in France the issue of illegal migration was formulated in relation to “clandestine” employment and access to the labour market, whereas in the UK it related to a more diffuse public concern about “numbers” of (especially New Commonwealth) immigrants. No doubt there will be time later for the SIMs team to discuss this amongst themselves, but this workshop was an excellent way to draw a line under a year of enormously productive archival work. 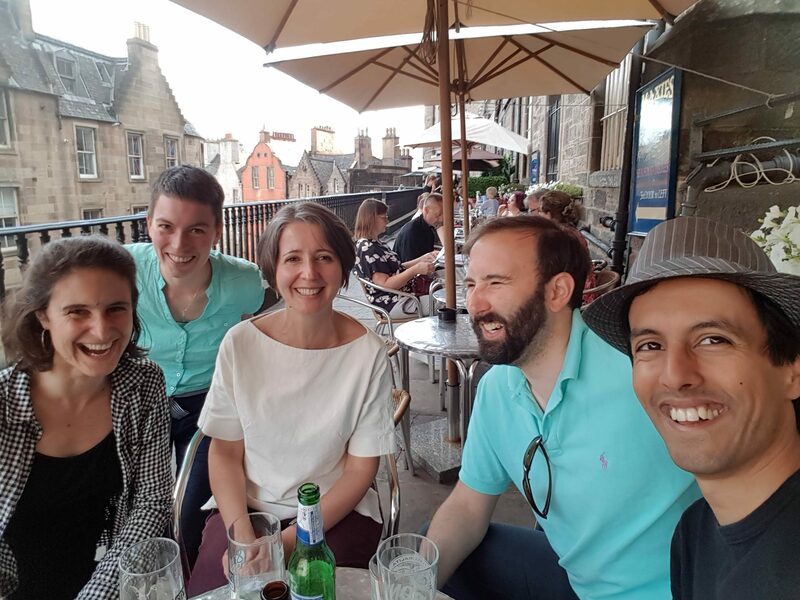 Congratulations to our postdocs for being so cheerful, productive and hard-working this year – we look forward to many more fascinating insights from them!